Because we all have those days (ok, weeks too) that tend to be busy and you just don’t have time to cook or you don’t feel like cooking, you need an easy recipe in your life. So save this recipe for those busy days! This one is low calorie, low fat, and super high in protein! This one calls for a can of reduced fat cream of mushroom soup, so if you are going Gluten Free make sure to buy the Gluten Free Brand of Cream of Mushroom. The sour cream mentioned below as the last step can be optional. Serve this in warm tortillas or taco shells. Add your favorite toppings like cilantro, tomatoes and lettuce and you will be set! Easy meal time!! Add chicken to slow cooker. Sprinkle taco seasoning over chicken. Pour salsa and soup over chicken. Cook on low for 6 to 8 hours. Remove from heat and still in sour cream. 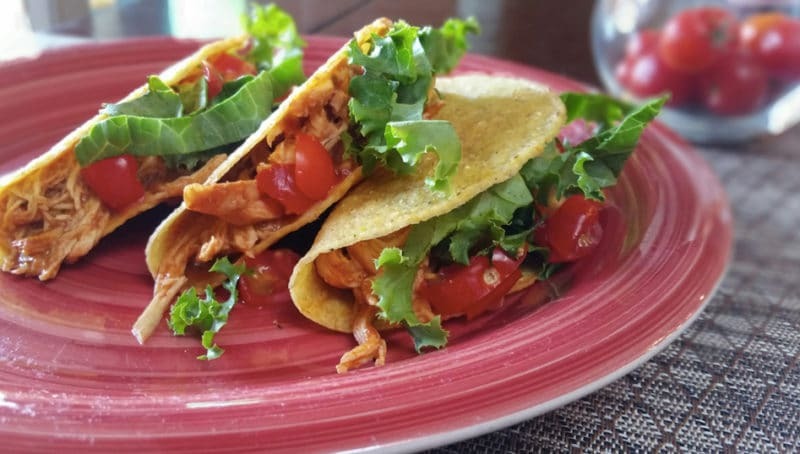 Serve with rice, beans, tortillas, taco shells and all your other favorite taco toppings! !